EASTON, PA (June 5, 2013) – Lauren’s First and Goal Foundation is thrilled to announce that its 10th anniversary football camp has set a new record – raising more than $104,000. The event on Sunday, June 2 at Lafayette College had set a previous high in 2012 with more than $85,000. Camper registrations and donations from the event go directly toward the foundation’s mission of supporting pediatric brain tumor research, patient services and families living with the disease. While Rutgers head coach Kyle Flood had an outstanding message as this year’s guest speaker, it was 16-year-old Lauren Loose who was the story of the day. Lauren, for whom the foundation is named, shared a brief prepared speech with the crowd of campers, families and volunteers. She was also joined by family friend Kelsey Hawkins, a 24-year-old pediatric brain tumor survivor who traveled with her family from Connecticut to volunteer and help celebrate the day. "The 10th anniversary camp here in PA was our most successful ever, thanks to our corps of dedicated and generous volunteers, college football coaches, athletic trainers and medical staff, and, of course, all of the student athletes who traveled to attend," said LFG founder Marianne Loose. "We are thankful to all the high school coaches who helped to organize their teams and travel as a group to support the foundation and learn about the opportunities to further their education and athletic careers in college. "We are thrilled that Coach Flood was able to spend the afternoon meeting and speaking to players, parents and our volunteers. We sincerely hope that everyone involved left the fields on Sunday knowing that they were an important part of the effort to assist children and families dealing with pediatric cancer, and advance research toward a cure for pediatric brain tumors," Loose added. Nearly 2,100 high school athletes from 16 different states – including those as far away as Florida and Arizona – descended on the College’s Metzgar Athletics Complex to receive instruction in a variety of offensive and defensive skills from college coaches from around the country. The coaching contingent included 316 college coaches, one from the New York Jets and 10 from the Kicking Connection. There were 114 colleges and universities represented. 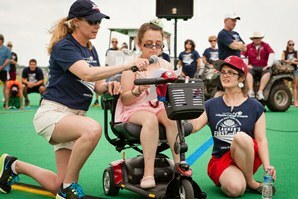 In addition to the Pennsylvania event, LFG will host its fourth annual Lauren’s First and Goal Football Camp Ohio on Saturday, June 22 at Otterbein University in Westerville, Ohio. Student-athletes can register online here. The foundation has raised more than $168,000 this year and more than $1.5 million since 2004 as a result of tremendous community support and generous donors. Follow the latest foundation news on Twitter at www.twitter.com/LFGfootballcamp and Facebook at www.facebook.com/LaurensFirstandGoal.